What made my heart stop when I was visually devouring the images of beloved Jewish foods in this beautifully photographed book was not the pistachio halvah, the toasted onion bialys or poppy seed and onion topped pletzels; crispy potato latkes; rich, dairy matzo brei; or even Ratner’s cheese blintzes or raisin and walnut filled rugelach—all of which I love, love, love. (Certainly not the p’tcha, Cel-Ray soda, gribenes or kasha varnishkes, which are not my favorites.) What made me gasp was the Charlotte Russe. Like Proust’s madeleine, the Charlotte Russe, which I used to buy in a small candy story across from my Bubbe’s stoop on Henry Street on the Lower East Side, brought back the most delightful memories. While cheese cake, fricassee, chicken soup and the many other wonderful dishes in Eating Delancey can be replicated, it is rarer to find the Charlotte Russe, that delicate delight of sponge cake and jam held together in around, open-bottomed paper cup, topped with a mound of sweet whipped cream and a maraschino cherry. Eating Delancey is filled with historical as well as mouthwatering images, memories and recipes. Maybe you will find in it the dish that touches your gastronomic heart. Joan Rivers wrote the introduction and Fyvush Finkel, Jackie Mason, Milton Glaser, Paul Goldberger and Robert Klein are among the many contributors to this wonderful volume. Yum. 1. To make the filling, combine all ingredients in a bowl and mix thoroughly. 2. To make clarified butter, melt butter in a saucepan over low heat. Remove from heat and let stand for 2 minutes. Skim foam from butter, if any, and pour off clear, oily looking butter into container. Stop pouring when you reach the milky residue in bottom of pan. Refrigerate until needed. 3. To make the pancakes, in a bowl combine eggs and water and blend thoroughly. Beat in flour and salt. Mixture will be runny. 4. Pour 2 tablespoons of the batter into a hot, greased 7-inch omelet pan. Rotate skillet so bottom of pan is covered evenly. 5. Cook for 3 or 4 minutes on one side, or until golden. Remove from pan and repeat process using all the blintz batter. Pile on top of the other, uncooked side down. At this point blintz pancake is ready to be filled. 6. Place 2 heaping tablespoons of filling on one half of the unbrowned side of the pancake. Fold pancake over once to cover filling. Fold in sides of pancake. Continue rolling. 7. Heat butter in a skillet until hot. 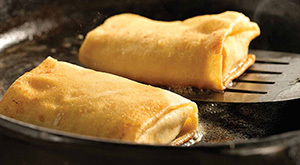 Place blintzes, seam side down, in a skillet and sauté until golden on all sides. Serve hot with sour cream. Makes 16 small or 8 large rugelach. 1. Combine flour, butter and cream cheese. Mix well; form into 4 balls. Wrap each ball of dough in parchment paper or plastic wrap. Refrigerate overnight. 2. 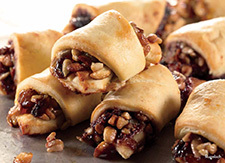 Combine sugar, cinnamon, raisins and walnuts for the filling. On a marble pastry slab (cooled) roll out each ball into a circle 1/4-inch thick and about 12 inches in diameter. If making a fruit version, spread jam over the rolled-out circle. Then sprinkle with filling. Cut each round into 16 weeds (or 8 wedges if you prefer a larger rugelach) and roll into crescent shapes. 3. Bake in a 375-degree oven for 15-20 minutes. 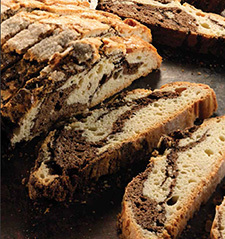 Recipes excerpted from Eating Delancey: A Celebration of Jewish Food by Aaron Rezny and Jordan Schaps, introduction by Joan Rivers, published by powerHouse books. I’ve made blintzes for years, usually with dry cottage cheese that needs to be strained to a fine consistency, and with what New Yorkers can buy called Farmer Cheese. This isn’t available west of the MIssissippi, except maybe in California–never farmer cheese, and no longer have a source for dry curd cottage cheese. Is there any really successful way to “manage” regular cottage cheese? large or small curd? nothing I’ve tried really works well. I live in the Mountain West.